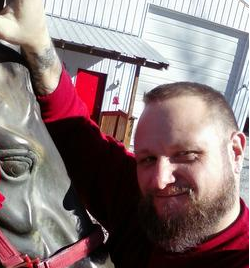 Billy Roper, long-time neo-Nazi with Klan ties, announces political bid. As white nationalists come out in droves to support Donald Trump, so much that the white nationalist group American Freedom Party paid thousands of dollars on robocalls calls in Iowa, another racist attempts to capitalize on Trump’s inflammatory rhetoric by running for office as a vice presidential candidate. Billy Roper, neo-Nazi with Klan ties from Arkansas, recently announced his bid as an independent for the Free Nation Party (FNP), whose website has little information about its platform and origins. While Roper will most likely lose, Donald Trump’s refusal to vehemently distance himself from the white nationalist community has inadvertently made it socially acceptable to engage in white supremacist rhetoric--so much so that even a former Klan member may believe that his racist campaign may have a chance. Roper, a well-known figure in the white nationalist movement, isn’t new to politics, though. He attempted to run for governor of Arkansas under the Nationalist Party of America (NPA) ticket in 2010, a defunct, racist political party created to protect “every major issue of concern to White Citizens.” He also ran briefly as a presidential candidate in 2012, but ended up throwing his support behind fellow white nationalist and anti-Semite Merlin Miller, who was running on the American Freedom Party's platform (then called American Third Position, a white nationalist party founded in California). During the 2010 campaign, Roper claimed in an interview, “that racial separation, ultimately, is the only way to stop interracial conflict and violence.” Roper also ran for president in 2012 while he was chairman of his defunct group White Revolution, an umbrella group that attempted to unite all racist activists dedicated to the "14 Words", a phrase famously coined by David Lane a member of The Order, a white supremacist terrorist group responsible for the murder of Jewish talk-show host Alan Berg in 1984. Roper’s racist résumé is extensive, dating back almost two decades, including serving as the deputy membership coordinator for the neo-Nazi group National Alliance in 2000. Two years after that, in 2002, he founded another neo-Nazi group, White Revolution. In an interview with racist skinhead Blood and Honour Radio in 2005, Roper claimed, “Every non-White on the planet has to become extinct. We need to remove these minor-league amateur races out of the game, and refine the playoff brackets a bit, if you get my meaning.” He was also one of the speakers at “Patriot Action,” a racist skinhead gathering sponsored by the neo-Nazi skinhead group Volksfront and the racist (and now defunct) East Coast White Unity in April 2009. Most recently, Roper and racist colleague Paul Mullet founded Divine Truth Ministries, a new Christian Identity outfit aiming “to establish a new Republic of the United Aryan States, for our racial brothers and sisters in the current Mongrelized United States of America,” and “(To deprogram) [sic] and reinstall our Racial culture, heritage, pride and destiny of our White Race.” Christian Identity is an anti-Semitic and racist theology that is “Christian” in name only. It’s unclear what Roper is hoping to accomplish with his bid, though the current political climate is vastly different and even more favorable, in some ways, to racist and white nationalist views than when Roper ran in 2012. This election cycle, Trump’s popularity has continued to grow after he labeled Mexican immigrants “rapists” and “drug dealers,” and called to ban Muslim immigrants from the country. According to a recent CNN/ORC poll 41 percent of Americans support Trump, even though he failed to issue a comment distancing himself from a staffer who retweeted the account @WhiteGenocideTM, an idea that proclaims white people, far from ruling most of the developed world, are actually being subjected to a genocide that will ultimately wipe them out.